Nearly 325,000 people could be affected by an eruption of Cotopaxi, the volcano looming beyond the Ecuadoran capital of Quito, officials said Monday. The biggest risk is from an eruption melting the 5,900-meter (19,000-foot) mountain's snowcap and triggering massive melt-water floods and lahar mudflows that could sweep through nearby towns, Ecuador's minister of risk management Maria del Pilar Cornejo told a press conference. 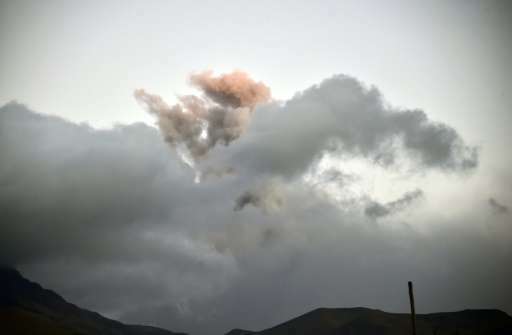 Considered one of the most dangerous volcanoes in the world, Cotopaxi sent an ash plume high into the sky on Friday, before spewing several smaller clouds and leaving surrounding towns with a light dusting of volcanic ash. The last eruption was in 1877. Several small earthquakes were also recorded. In response, the government issued a state of emergency and ordered the evacuation of some 500 people in the immediate vicinity of the volcano. Ecuador's Geophysical Institute reported early Monday that there had been no new ashfall and little sulfur smell in the area during the previous 24 hours. But they labeled internal activity at the volcano "high" and surface activity "moderate." The state of the volcano, the institute said, was "actively erupting." "No pyroclastic eruption have taken place, so there are no lava flows," security minister Cesar Navas said. But he added that "there is evidence of fluid moving inside the volcano, as well as gas and magma."